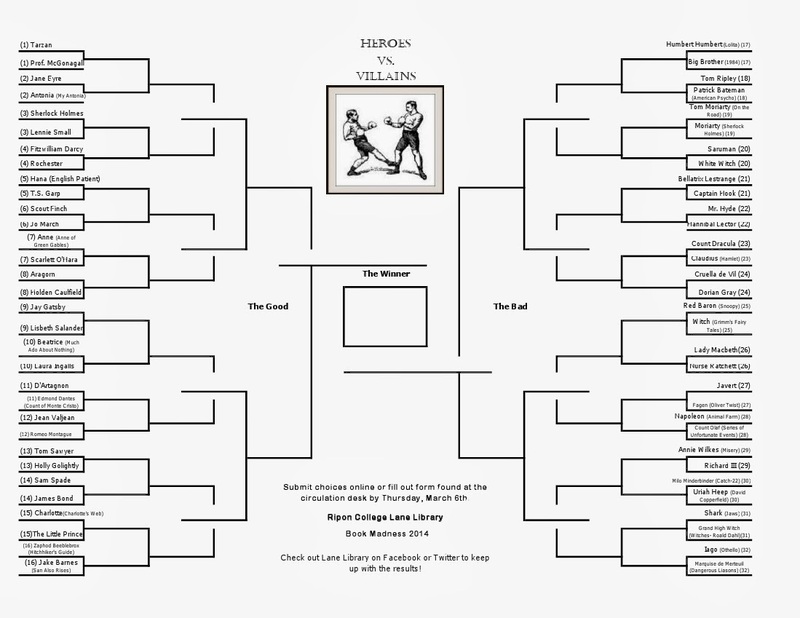 Ready for a little bookish March Madness? Announcing our very own Heroes vs. Villains tournament this March, where you decide who gets to move on to the next round. Voting is already open in the first round at http://bit.ly/1gHOekd, or stop by the circulation desk at the library and fill out a form there. With 32 hero match-ups and 32 villain match-ups, the battles will continue to go on until the end of the month, when you decide with your votes who will remain standing. Heroes vs. heroes, and villains vs. villains until the very last round. If you are interested in viewing the brackets, get your glasses on because below is the image with our first round characters. First round voting will continue through Thursday, March 6th, and our first winners will be announced on Friday, March 6th; stay tuned to our Facebook and Twitter pages for updates. Best of luck to the good and bad, and may the best character remain win at the end of the month!